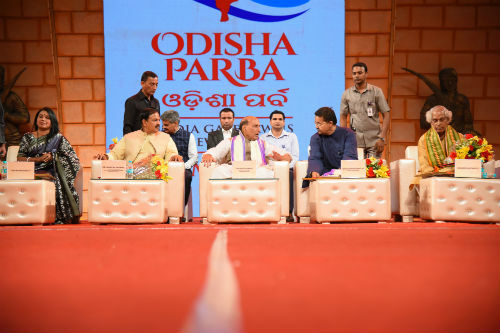 New Delhi: Odisha Parba 2018, a three-day mega celebration in the heart of India’s national capital New Delhi received overwhelming response by the visitors. Many visitors including visitors from various foreign countries relished the authentic taste of Odisha and experienced the essence of rich cultural ethos of Odisha at this event. Over 2 lakh visitors were thrilled with joy to witness Odisha’s magnificent journey from the ancient era to the illustrious contemporary times. Organized by Odia Samaj, Odisha Parba 2018, a celebration of Odisha’s Culture, Tradition, Heritage & Cuisine was inaugurated on 9th March 2018 at India Gate Lawns, New Delhi. 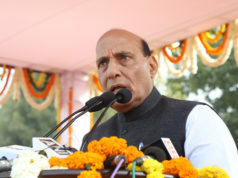 In the valedictory ceremony of this event, Hon’ble Minister of Home Affairs, GOI, Shri Rajnath Singh was the Chief Guest and Mr. Mahesh Sharma, Hon’ble Cultural and Tourism minister was the guest of honor. Among the other dignitaries were Hon’ble Member of Parliament Shri Bhartruharai Mahtab, Padma Shree Sudarshan Sahoo, Padma Shree Aruna Mohanty, Mr. Sangram Dhar and Odia Samaj President, Mr. Sidharth Pradhan. The guest of Honour of the mega event Shri Dharmendra Pradhan Union Minister for Petroleum and Natural Gas, Skill Development and Entrepreneurship said, “The work of Odia Samaj is worth praising! This 3 day festival was a delight as artists and vendors have been invited from the nooks and corners of Odisha to highlight our rich culture and heritage. I am glad to be a part of this event which would take even the non-Odias through a journey of Odisha”. On its final day, Odisha Parba started with a series of enthralling Fusion Paika Nacha and Bagha Nacha. Odissi performances by Padma Shri Aruna Mohanty mesmerized the audience. Musical performances by Famous Bollywood singer Mr. Krshna Beuraa attracted the audience with their Enthralling performances. Odia song by ‘Hati Saja Kara’ by Susmita Das was another attraction of the last day. A contemporary dance Kalinga Gatha along with Aranya Dhwani, kalanga Danda, Dakul was also performed. One of the main highlights of this three-day extravaganza was authentic Odia food that not only evoked the nostalgia of Odia people but also indulged the sense of the bon-vivant Delhiites. From mouth-watering snacks to lip smacking desserts, from hearty veg-non-veg thali to exotic sea food, people got a huge platter to relish on. 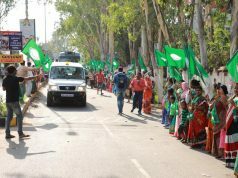 Long queues were noticed in peak hours and everyone savored the special Odia food while enjoying the cultural programme on the stage. This year the entire food court has been designed in a fort style, reflecting the ambience of “Baarah Maasi Tera Parba”, which reflects Odisha’s passion for festivals in one calendar year. One of the handicraft vendor, Sanjeeb Kumar Nayak said, “We got a very good response overall and we have managed to sold a number of our items”. One of the food vendor, Narayan said, “We have sold 2 quintal of our traditional Puri Khaja and Ananda Ladoos in two days and today it has again began in a great note”. On the second day, a first of its kind fashion show was organized with the theme of ‘Odisha Handloom Fashion Show’ woven around the beautiful textiles from Odisha. Three renowned designers, Divya Sheth, Shruti Sancheti and Raas presented an unforgettable journey into the world of weaves, with their modern and unique twists to celebrate this unique amalgamation of Odiya craft and fashion. The 2nd edition of OdishaParba has covered 50% more area than last year; totally spreading over an area of 2 lakh 60 thousand sq. 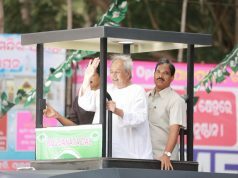 ft, the event is showcasing the rich legacy of Odisha. The entrance gate designed in the shape of ‘DolaBimana’ replicates a common sight in Odisha, during the festival of Holi. Intricate pattachitra design is adding colours to this decorum. A Grand Stage set up with backdrop of historic Barabati Fort is evoking the glorious past of Odisha. More than hundred handloom, handicraft, itinerary and food stalls highlighting the rich cultural heritage of Odisha. A large number of visitors flocked to these stalls and took delight in viewing Odisha’s celebrated works of arts and crafts. Particularly women customers along with teenagers were thoroughly enjoying their shopping time in dhokra jewellery stalls, saree and kurta stalls and were taking selfies. “The response was very positive” said several handloom and handicraft stall owners who also received appreciations from many visitors and guests for their awesome creations. The ambience was completely festive and definitely an affair to remember for a long time.